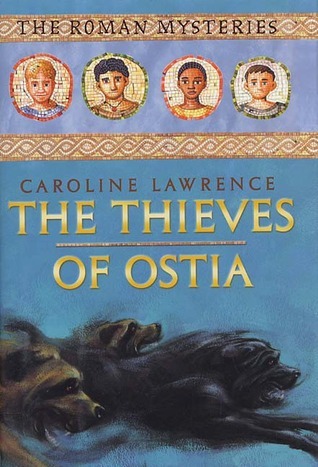 The Thieves of Ostia takes place in June of the year 79 A.D. Flavia Gemina is a young Roman girl who lives with her father and who has a talent for solving mysteries. She and her friends - a Christian named Jonathan, a mute boy named Lupus, and a slave girl named Nubia whom she purchases to rescue her from abuse - are troubled when they learn that family guard dogs are being beheaded and left to die in their neighborhood. When they learn that a local man’s daughter died of hydrophobia (rabies) after being bitten by a wild dog, they are sure he is to blame for the terrifying killings, but they must first find proof. Despite the ancient setting, the writing in this book has a strong contemporary vibe. The dialogue is written very informally, and the way the characters interact with one another is similar to the way tween friendships are portrayed in novels set in the present day. Readers will feel at home with the characters, which in turn, will help them become invested in the historical details intertwined with the plot. Interestingly, and unexpectedly, this book is considerably darker and more violent than the front cover on either the paperback or hardcover edition suggests. Lupus, the young boy who is mute, has had his tongue cut from his mouth. Girls are routinely rounded up on the streets and sold into slavery. Beheaded dogs are described in detail, and some of the children witness a brutal suicide. Some of these scenes would definitely be too graphic for a fourth or fifth grader, even though the reading level and characters would be a perfect fit. Parents and teachers will want to use their discretion when suggesting this book to specific readers. Though the story is fictional, the historical events in this book occur as they really happened. Though the mystery can be enjoyed by any reader, this series will be that much more fun to read for kids who are simultaneously learning about ancient Rome, as they will understand references to place names, rulers (like Vespasian and Titus, his successor), and events. Kids should also be prepared for an overwhelming desire to read the second book right away, as the ominous epilogue talks of the peace and safety the children will enjoy in Pompeii over the summer.